A little information from the filmmakers. Skin Deep is a feature documentary about the controversy surrounding Morgellons Disease. A group of doctors and scientists claim that Morgellons — a disease whose symptoms include fatigue, brain fog, skin lesions and fibers growing victims’ skin — is linked to Lyme Disease. Other doctors claim that Morgellons is nothing but a delusion, that the patients’ fibers and lesions are self-inflicted. Skin Deep: The Battle Over Morgellons dives headfirst into the controversy. We follow the patients who suffer and the physicians who treat them… with antibiotics or anti-psychotics. The Charles E. Holman Foundation announced that February 2018 is the first ever Morgellons Disease Awareness Month. Peer-reviewed studies (https://www.ncbi.nlm.nih.gov/pmc/articles/PMC4278782/) report that 6% of Lyme Disease sufferers have Morgellons Disease, and we hope that the two communities can come together in solidarity around issues of patient care and dignity. Cindy Casey, the president of the Charles E. Holman Foundation, is a Morgellons patient and registered nurse who is a main character in the film. Skin Deep and the Charles E. Holman Foundation hope that by naming February as an awareness month, people will feel empowered to share their stories so that those suffering from Morgellons Disease know that they are not alone and can send a message to the medical community that Morgellons is real. 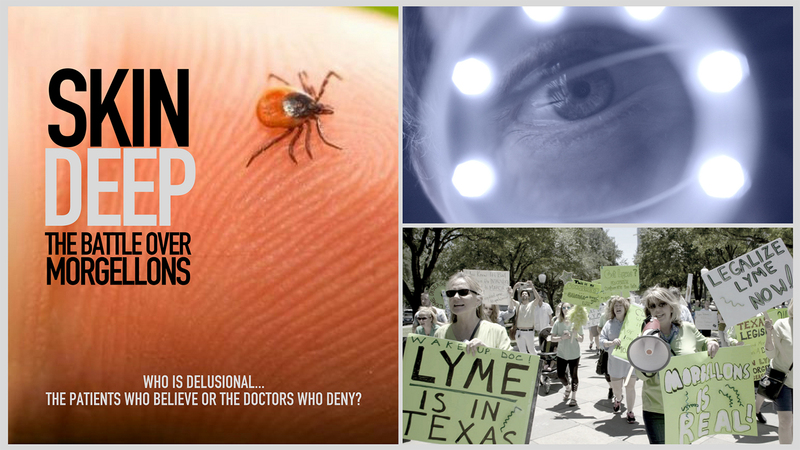 I’m guessing that many of you who read this post will say to yourself “I know someone with Lyme/Morgellons.” Sadly, there are going to be more and more people saying that as we move forward into a warmer, rapidly modifying world. This film is worth your time and attention, and even your hard earned dollars if you so choose. Take a look, have a listen and let me know your thoughts. And for those of you with Lyme/Morgellons, keep on fighting. I am a sufferer of Morgellons and in this documentary. Pi has incredible talent and has told our story well. This will be one to watch. The disease is so horrifically intriguing, you will have trouble wrapping your brain around it. Thank you, Pi Ware, for bringing attention to this disease. That is SUCH a strange one. Sorry to hear. Pi is going for it, which is what we need. This horrifying disease is completely ignored by most medical doctors. Presently, I have been to over 10 doctors without any help. Whatever you do, never say the word Morgellons. Just keep explaining and showing but the minute you say, Morgellons you will be escorted right out. Ask your doctor to explain to YOU what’s wrong. He/she won’t know but that’s okay just keep going. I made the mistake of thinking the next doc would be the one…Stay with the one you have if you like him/her and ultimately force their hand to figure out a treatment. There is a new documentary out about the connection between Morgellons and Lyme. Really sorry to hear. So yes, you are in the same boat. Unpopular disease. I know there is a good documentary about Morgellons and Lyme that came out last year. Shot by someone in Los Angeles. Morgellons is so damn strange, and for sure it won’t fit the cookie cutter world of modern medicine. Sorry to hear.